Internationally known and published, American portrait artist and writer/commentator ­ Dave Merrick, is offering for sale the original, oil and acrylic painting entitled, "Forward." This image has steadily appeared in various online journals, magazines, blogs and e­mails throughout the world. There is little doubt that the reader has already seen this work accompanying various politically oriented articles or from simply cruising the Internet. 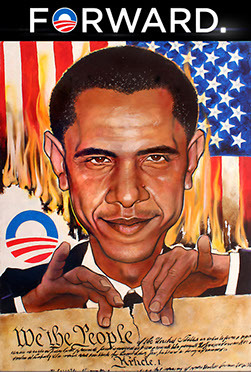 The painting was executed and completed just months before Obama's second election. The moment the image hit the web, it was used by several online publications as well as several million frustrated American citizens ­ in e­mailing, office bulletin boards and roadside signs, nationally. Many people felt that the piece, in a glance, summed up the violence this president is waging against our Constitution and the free Republic founded upon that magnificent and singular document. 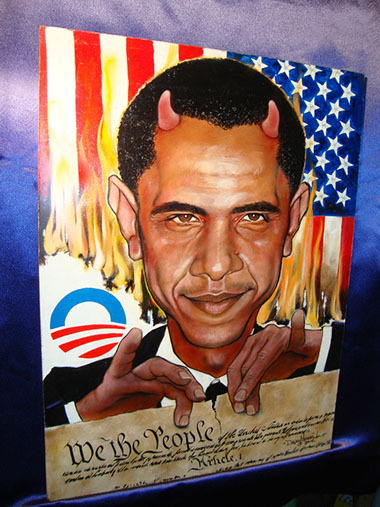 The original painting appropriately features Obama sporting a set of quite realistic horns (see pic of original displayed on purple satin). When it was first released, a Photoshopped version without the horns spread much faster (perhaps being less of a religious statement), and so that is the image most people have seen. The crowning word, "Forward," was also added electronically and was never part of the original painting. At the buyer's request, Mr. Merrick will paint out the horns to closer match what most of the world has seen. Offers will be accepted, starting at $25,000. Insurance for shipping and all shipping charges will be paid for by the buyer. The actual artwork is handpainted by the artist, on an 18" x 24", quarter­inch thick, gessoed board. (All Dave Merrick original paintings are done on board ­ never canvas ­ which produces a smoother texture with tighter detail.) The painting is cover­coated with a state­-of­-the­-art, museum quality, clear finish which resists yellowing.